The native form of this personal name is Fock Jenő. This article uses the Western name order. Jenő Fock (Hungarian pronunciation: [ˈjɛnøː ˈfokː]; 17 May 1916 – 22 May 2001) was a Hungarian Communist politician who served as Chairman of the Council of Ministers of the People's Republic of Hungary from 1967 to 1975. Fock joined the Communist Party of Hungary in 1932. During the Second World War, he was imprisoned for his Communist activities from 1940 to 1943. After the founding of the People's Republic of Hungary on 20 August 1949 he participated in communist governance from 1952 to 1954 as Minister for Steel Industry. 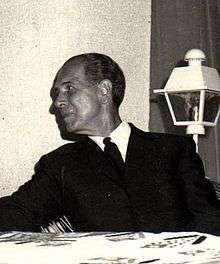 In 1957 he became secretary of the Central Committee of the Hungarian Socialist Workers' Party (MSZMP) and then in 1961 he served as Deputy Prime Minister. From 1957 to 1980, he is also a member of the Politburo of the Central Committee. On 14 April 1967, he became the successor of Gyula Kállai as prime minister. During his tenure, he unsuccessfully tried to introduce some market economy elements. Formerly the Central Committee of the MSZMP announced János Kádár’s plans for the reform of the economy, known as the New Economic Mechanism (NEM). The reform is considered as "the most radical postwar change" of any Comecon country. The plan, which became official 1 January 1968, was a major shift to decentralization in an attempt to overcome the inefficiencies of central planning. The NEM represented a move away from the Joseph Stalin economic system of compulsory plan indicators in favor of a policy that states profits as the enterprises main goal. The new economic policy was a "comprehensive reform of the economic system", creating market relationships among firms, using prices as allocative functions and firms responding to prices to maximize profits, and using profits to budget new investments. These attempts failed, because of the resistance of the Economic Community of Warsaw Pact states, Comecon. As a result, Fock had finally withdraw in favor of György Lázár on 15 May 1975. Between 1945–1947, 1958–1967 and 1971–1985 he was a deputy in the National Assembly of Hungary. Later he was president of the Association of Technical and Professional Societies (MTESZ). A szocializmus építésének gazdaságpolitikája. Kossuth, Budapest, 1973. Fock died in Budapest on 22 May 2001, just five days after his 85th birthday. 1 2 Balassa, Bela. The Economic Reform in Hungary. Economica, New Series, Vol. 37, No. 145. (Feb., 1970), pp 1–22. ↑ Granick, David. The Hungarian Economic Reform. World Politics, Vol. 25, No. 3. (Apr., 1973), pp. 414–429. ↑ "Elhunyt Fock Jenő". Index.hu. Retrieved 2011-12-13. Akadémiai kislexikon I. (A–K). ed. Mihály Beck, Vilmos Peschka. Budapest. Akadémiai Kiadó. 1989.